U.S. 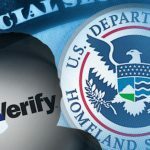 Citizenship and Immigration Services (USCIS) launched a modernized version of E-Verify on April 23, 2018. The changes are a result of gathering feedback and extensive testing from E-Verify users and are intended to enhance the employment eligibility verification process. E-Verify is a program that allows participating employers to confirm employment eligibility of newly-hired employees by comparing information provided on the Form I-9 against records available to the Social Security Administration (SSA) and the Department of Homeland Security (DHS). Participation may be mandatory for employers with federal contracts or required under certain state immigration laws. President Trump and Congress have indicated that E-Verify may become mandatory for all employers in the near future. The April 23, 2018, modifications reflect just how far the electronic verification concept has evolved since it was proposed in the early 1990s when Congress called for the testing of alternative verification systems that could prove more effective than the Form I-9 process. In 1994, the SSA and the Immigration and Naturalization Service (INS, now DHS) were asked to institute a national registry combining both agencies’ data for use in electronic employment verification. Although the SSA and INS could not combine data at that time, they did test electronic verification for new employees for a number of pilot employers using each agency’s data separately. Employer participants quickly identified problems with the original Basic Pilot Program. Since then, improvements have been made to E-Verify as technological capabilities have advanced. Real-time feedback on errors: This change addresses a historical challenge in the system. It is likely to increase the immediate identification of errors and lead to improved compliance statistics for employers, as it will allow users to correct data and prevent tentative nonconfirmations (TNCs). A personalized “Are You Sure?” alert showing only fields that may have triggered a TNC: This change focuses the user on errors more easily. A streamlined TNC process: Under the updated process, cases are sent to SSA and DHS simultaneously, allowing for the issuance of a dual TNC in instances where both agencies issue a TNC. This is likely to help provide faster results to employers and employees, and limit the negative effects of a TNC, which typically cause stress, missed work, and loss of productivity while the employee works to resolve the problem. Requirement that users enter a reason why an employee is working after receiving a final nonconfirmation (FNC): In certain instances, an employer may decide to continue to employ an individual in spite of a FNC. Until now, an employer has not been able to create a record regarding its choice. This option requires the employer to record its reasoning and the circumstances surrounding the individual’s continued employment. The monitoring and compliance branch will be able to view this information. The expansion of E-Verify is an important feature of President Donald Trump’s overall immigration plan. It is one of the changes that he believes would help to eliminate the jobs magnet that brings illegal workers to the United States and ultimately harms U.S. workers. In his proposed budget, Trump requested $23 million to expand E-Verify and make it mandatory nationwide. The 2018 Omnibus budget, however, simply extended the E-Verify program until the end of the fiscal year.